A lorry driver who killed a mother and three children while distracted by his phone has been jailed for 10 years. 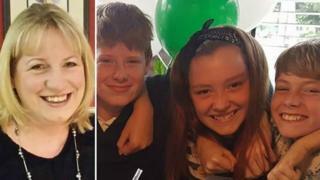 Tracy Houghton, 45, died instantly along with her sons Ethan, 13, and Joshua, 11, and her partner's daughter Aimee Goldsmith, also 11, when Tomasz Kroker smashed into stationary traffic. Judge Maura McGowan said his attention had been so poor he "might as well have had his eyes closed". Kroker, 30, was scrolling through music selections at the time of the crash. The court heard he had been so distracted he barely looked at the road for almost a kilometre. The judge described the case as the most horrific she had ever seen. Kate Goldsmith, whose daughter Aimee died in the crash on the A34 near Newbury in Berkshire, said Kroker had turned his lorry into a "lethal weapon" by using his phone while driving at 50mph, and she made a plea to all road users to learn the lessons from the case. "We urge you to make a personal commitment to stop using mobile phones while driving and make our roads safer for everyone," she said. Speaking outside Reading Crown Court, she said: "The 10-year sentence will not ease our pain and suffering, nor do we believe it will send a strong enough message to those who lack the self-restraint to not use a mobile phone when driving." Ms Houghton's partner Mark Goldsmith and his 13-year-old son Jake were in a car that was struck by Kroker. The court heard how the Vauxhall Zafira being driven by Mr Goldsmith was shunted into the Corsa containing the rest of the family, which was forced underneath a lorry in front. The Corsa was compressed to a third of its normal size, the court was told. Prosecutor Charles Ward-Jackson said: "It is a particularly distressing feature that the two surviving members of the family were in the car behind, and a 13-year-old boy was forced to witness at close range the deaths of four members of close family." Some family members left the court as the prosecution began to show photos of the crash scene and video from the lorry's cab camera. 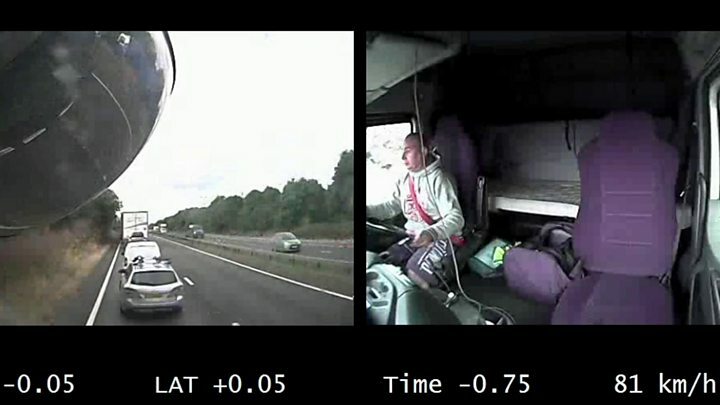 Others were reduced to tears as video of the crash was shown. Less than a second before the impact, an onboard camera showed Kroker, originally from Poland, "looking up with sudden horror on his face... it was too late to take any avoiding action", the court heard. In the pile-up, Kroker also seriously injured Mazda driver Adam Pearson, whose car was thrown on to its roof, leaving him with a collapsed lung and a broken back, and also injured the two occupants of a Citroen. 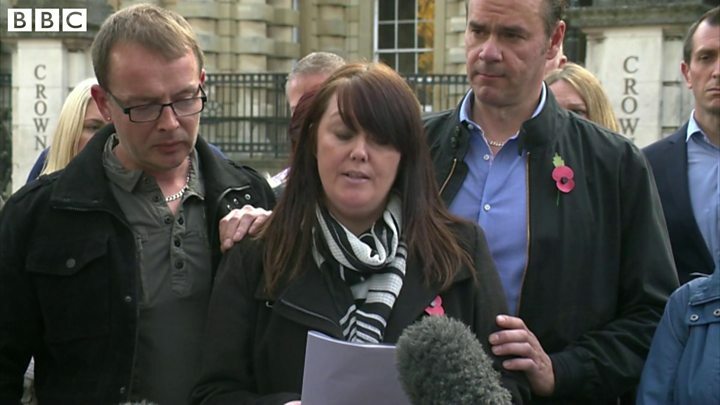 Jake Goldsmith, who witnessed his sister Aimee's death, now suffers from post-traumatic stress disorder, according to a victim impact statement from his mother Kathryn. "Jake doesn't talk much any more, he doesn't have much to say," she said. "Our nights are plagued with nightmares and broken sleep." The court heard that an hour before the pile-up, Kroker had signed a declaration to his employer, promising he would not use his phone at the wheel. He initially told police his brakes failed, and the traffic in front of him "just stopped". He was also found to have lied to his bosses about whether he had been distracted, claiming he had the radio on. The lorry driver, from Trajan Walk, Andover, Hampshire, pleaded guilty on 10 October to four counts of causing death by dangerous driving.